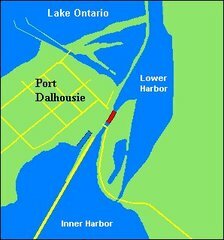 For over 100 years (1829 - 1932) Port Dalhousie functioned as the northern entrance to the Welland Canal. This ended with the closure of the Third Welland Canal in 1932. Since then Port Dalhousie has become a part of the City of St. Catharines. It's also developed as a tourism destination with a marina, restored buildings and a revitalized waterfront. The history of the Welland Canal in Port Dalhousie is a history of regular construction and redevelopment. Four different stages of development are discussed below. Maps and surveys taken before the First Welland Canal was was built shows Port Dalhousie as the place where 12-mile creek emptied into Lake Ontario. The creek near Lake Ontario opened up into a large low-lying marsh or lagoon with a defined stream running through the middle The edges of the valley remained steep and separated from the marshy area. Settlement of Port Dalhousie started during this time with a few homes built on the west side of the valley. 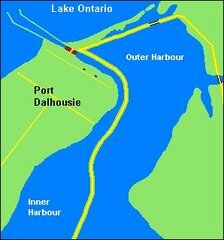 Greater settlement and the naming of Port Dalhousie came with the building of the first canal. When the First Welland Canal was built in 1825-29 effort was made to utilize natural waterways as much as possible. A dam was built at the mouth of 12 mile creek to raise the level of water upstream. 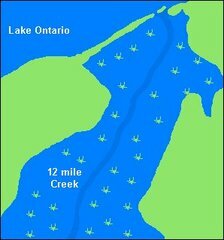 Where 12 mile creek emptied into the Lake Ontario a channel was created in a northwest direction into Lake Ontario with piers extending a short distance in the lake. Lock 1 of the First Welland Canal was built right beside the lake. A bridge built at the lock and across the dam also allowed people to cross 12 mile creek and from there follow a route that led to St. Catharines 5 km away. When the second canal was built in 1842-45, Engineers made several dramatic changes to the area. A new channel was established that allowed the canal to enter Lake Ontario in a more northerly direction. The size of the piers were also made much bigger. A new "lock 1" and a new and higher dam was also built across the valley, this time further inland. The Second Welland Canal also saw more commercial development. Stores were built beside the canal forming a short line of businesses that still remain today. Ships were built there. Port Dalhousie also got a small jail to keep unruly sailors in check. 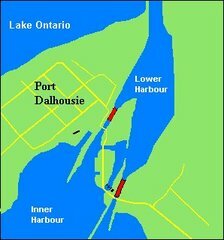 The Third Welland Canal also added a few significant changes to Port Dalhousie. While the earthen dam of the second canal was still used and the Second Welland Canal continued operation a new channel was dug for the Third Welland Canal along the eastern side of the valley. Here Lock 1 of the 3rd canal was built. Above the dam a route was also dredged across the pond to where the 3rd canal started it's route inland across the north end of present day St Catharines.